MILTON, Wis. — Gary Shackelford of north Rock County looked at the sky last March 11 and saw a remarkable gathering. Circling over his neighbor’s pond, bald eagles swirled in an aerial ballet. “I was astounded to see so many at once,” Shackelford said to the Janesville Gazette. People of a certain age remember when bald eagles were a rare sight. Eagle numbers plummeted to dangerously low levels because of the presence of DDT, a pesticide, in the environment, which caused eagles’ eggshells to weaken and break during incubation. The 2018 number of nests topped the previous year’s total by 105. 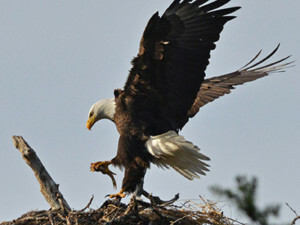 Still, bald eagles have room to grow, Fandel said. Moller of Hoo’s Woods Raptor Center will soon present a free indoor education program about eagles at Northside Intermediate School in Milton. She also will bring a second immature bald eagle, which came to Hoo’s Woods in late fall with a neurological injury. Hoo’s Woods helps birds of prey through education, rehabilitation and conservation. “One of the main causes of their mortality now is lead, which comes from lead ammunition,” she said.